FILE - The Clintons – Bill, Hillary and daughter Chelsea – speak at a 2014 Clinton Global Initiative University at Arizona State University in Tempe. Some critics say the Clinton Foundation represents a conflict of interest for the Democratic presidential candidate. The documents, provided by the conservative legal advocacy group Judicial Watch, are the latest evidence of overlap between Clinton's work at the State Department and that of the Clinton Foundation. In one instance, Clinton Foundation top executive Doug Band attempted to secure a meeting between Clinton and Crown Prince Salman of Bahrain, who had donated millions to Clinton charitable efforts. Clinton's top aide, Huma Abedin, later replied by saying that a meeting had been set up. In the emails, Abedin served as a go-between for several other Clinton Foundation donors who sought to meet with Clinton. 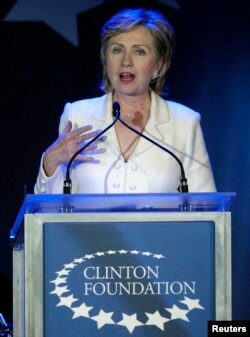 FILE - Then-Senator Hillary Clinton, wife of former U.S. President Bill Clinton, speaks at a fund raising gala for the Clinton Foundation in New York, Oct. 28, 2006. Her Republican presidential rival, Donald Trump, has used the issue to paint Clinton as corrupt, saying she was engaging in "pay-to-play" practices with donors. On Monday, Trump renewed his call for the Clinton Foundation to be shut down, repeating his accusation that the charity group represents a conflict of interest for Clinton. Earlier email releases suggested State Department aides to Clinton looked into doing favors for Clinton Foundation donors or those linked to donors. But nothing has shown that the favors were actually granted. In another instance, Clinton Foundation official Band asked a top Clinton aide at the State Department about getting a job for an individual whom he said it was "important to take care of." The individual, whose name was redacted in the email, was subsequently sent "options," according to a reply by Abedin, the State Department aide. The outcome of the apparent job placement effort is not clear. Clinton herself has not been implicated in any of the emails. Clinton campaign officials have firmly denied any wrongdoing, saying any decisions by Clinton were made without considering the influence of donors. More recently, they also have begun to use the issue as a way to launch counterattacks on Trump's business dealings.